This article is about the actor. 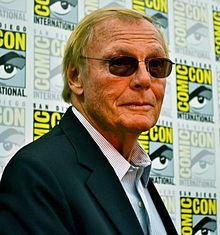 For the Family Guy character voiced by him, see Adam West (Family Guy). For other uses, see Adam West (disambiguation). West began acting in films in the 1950s. He played opposite Chuck Connors in Geronimo (1962) and The Three Stooges in The Outlaws Is Coming (1965). He also appeared in the science fiction film Robinson Crusoe on Mars (1964) and performed voice work on The Fairly OddParents (2003–2017), The Simpsons (1992, 2002), and Family Guy (2000–2018), playing fictional versions of himself in all three. 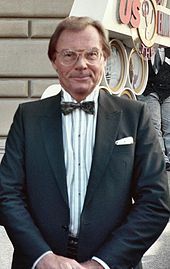 Late in his career, West starred in two direct-to-video animated Batman films, Batman: Return of the Caped Crusaders, and Batman vs. Two-Face, the latter of which was released posthumously. Adam West was born William West Anderson on September 19, 1928, in Walla Walla, Washington. His father, Otto Anderson (1903–1984) was a farmer; and his mother, Audrey Volenne (née Speer; 1906–1969) was an opera singer and concert pianist who left her Hollywood dreams to care for her family. Following her example, West told his father as a young man that he intended to go to Hollywood after completing school. He moved to Seattle with his mother when he was 15, following his parents' divorce. In 1994, West, with Jeff Rovin, wrote his autobiography, Back to the Batcave published by Berkeley Books. In 1997, Virgin Interactive released the gambling simulation game Golden Nugget. West acted in the video cut scenes of the "Chaos Mystery" storyline subgame. In 2001, he played the super-villain Breathtaker on the short-lived television series Black Scorpion. Walla Walla, Washington, Adam West's hometown, officially celebrates its annual "Adam West Day" on September 19, with the first one celebrated in 2017. During the Batman television series, West's relationship with co-star Burt Ward was described as "problematic". He said, "Burt fell victim to making up stories to sell books. But in a way it was flattering, because he made me sound like King Kong." West also said that he played Batman "for laughs, but in order to do [that], one had to never think it was funny. You just had to pull on that cowl and believe that no one would recognize you." Also during the Batman series, he became close friends with crossover co-star Van Williams, who played The Green Hornet. The two of them were also neighbors for a while and spent much time together outdoors, including fishing and hunting, a common hobby of Williams. West died in Los Angeles, California, on June 9, 2017, following a brief battle with leukemia. After his death, West's former Batman co-star and longtime friend, Burt Ward, released a statement; "This is a terribly unexpected loss of my lifelong friend, I will forever miss him. There are several fine actors who have portrayed Batman in films. In my eyes, there was only one real Batman that is and always will be Adam West. He was truly the Bright Knight." Batman: The Animated Series actor Kevin Conroy (who performed alongside West in the episode "Beware the Gray Ghost") said "Adam West was an incredibly good, generous actor. Loved working with him as Gray Ghost. A true gentleman". West's last public appearances were from March–April 2017 at the SouthCoast Comic Con & Collectibles Extravaganza in Hanover, Massachusetts, where he was the guest of honor, Fan Expo Dallas, and the second annual Silicon Valley Comic Con. ^ "'Batman' Actor Adam West Dies at 88". wnep.com. June 10, 2017. Retrieved June 30, 2017. ^ a b Gates, Anita (June 10, 2017). "Sad Day for Gotham: Adam West, Who Played Batman, Dies at 88". The New York Times. p. A27. ^ a b c Tooley, James E. (director) (2013). Starring Adam West (Documentary). United States: Chromatic Films. 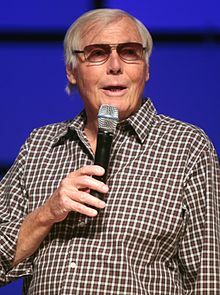 ^ "BIOGRAPHY: Adam West". Lifetime. Archived from the original on August 15, 2015. Retrieved August 15, 2015. ^ Maglio, Tony (June 10, 2017). "Adam West, TV's Batman in the '60s, Dies at 88". TheWrap. Retrieved June 12, 2017. ^ "Adam West, TV's 'Batman,' dies at 88 after battle with leukemia, family says". Fox News. June 10, 2017. Retrieved June 14, 2017. ^ Weiler, A. H. (May 22, 1959). "Young Philadelphians'". The New York Times. Retrieved June 12, 2017. ^ Freese, Gene (2013). Jock Mahoney: The Life and Films of a Hollywood Stuntman. McFarland. p. 107. ISBN 9781476612874. ^ a b Riggs, Thomas (2005). Contemporary Theatre, Film and Television, Volume 60. Gale Group. p. 312. ISBN 9780787690335. ^ Hill, Ona L. (1999). Raymond Burr: A Film, Radio and Television Biography. McFarland. p. 245. ISBN 9780786491377. ^ Muir, John Kenneth (2006). A History and Critical Analysis of Blake's 7, the 1978–1981 British Television Space Adventure (illustrated, reprint ed.). McFarland. p. 153. ISBN 9780786426607. ^ Maltin, Leonard (2015). Turner Classic Movies Presents Leonard Maltin's Classic Movie Guide: From the Silent Era Through 1965: Third Edition. Penguin. p. 491. ISBN 9780698197299. ^ Eury, Michael; Kronenberg, Michael (2009). The Batcave Companion. TwoMorrows Publishing. p. 63. ISBN 9781893905788. ^ "Interview with Cast of Batman, The Movie (1966)". Gordon Wilkison Collection. Interviewed by Jean Boone. Texas Archive of the Moving Image. July 1966. Archived from the original on April 13, 2014. Retrieved July 28, 2011. ^ "Batman for U.S. Savings Bonds, ca. 1966". US National Archives. January 24, 2014 – via YouTube. ^ "Batman, ca. 1973". US National Archives. January 28, 2014 – via YouTube. ^ "Youtube Video Classic: Batman Adam West vs. Jerry Lawler..Yes, Really!". PWInsider.com. ^ "Openings and Current Attractions on New York Screens". New York Magazine. Vol. 4. New York Media, LLC. September 20, 1971. p. 12. ISSN 0028-7369. ^ Stanley, John (1988). Revenge of the Creature Features Movie Guide: An A to Z Encyclopedia to the Cinema of the Fantastic, Or, Is There a Mad Doctor in the House? (3, illustrated ed.). Creatures at Large Press. p. 64. ISBN 9780940064041. ^ a b Van Hise, James (1992). Batmania II. Pioneer Books. ISBN 9781556983153. ^ Kay, Glenn (2012). Zombie Movies: The Ultimate Guide. Chicago Review Press. p. 335. ISBN 9781613744253. ^ McKenna, Michael (2013). The ABC Movie of the Week: Big Movies for the Small Screen. Scarecrow Press. p. 233. ISBN 9780810891579. ^ Scheuer, Steven H. (1987). Movies on TV '88-'89 (12 ed.). Bantam Books. p. 622. ISBN 9780553268515. ^ Scheuer, Steven H. (1989). Movies on TV and Video Cassette 1989–1990 (13 ed.). Bantam Books. p. 273. ISBN 9780553277074. ^ The Blockbuster Entertainment Guide to Movies and Videos: 1999 Edition. Island Books. 1998. p. 572. ISBN 9780440225980. ^ "Adam West touched many lives in his 30 years as an Idahoan". ^ Golden, Christopher (1995). Sophomore slumps: disastrous second movies, albums, singles, books, and other stuff (illustrated ed.). Carol Pub. Group. p. 229. ISBN 9780806515847. ^ "Batman Adam West". Batmania.com.ar. Archived from the original on June 10, 2011. ^ "Batman -Guia Visual". Dreamers.com. Archived from the original on June 13, 2012. ^ Sava, Oliver. "Batman: The Animated Series: "See No Evil"/"Beware The Gray Ghost"". Retrieved November 3, 2018. ^ Terrace, Vincent (2011). Encyclopedia of Television Shows, 1925 through 2010, 2d ed (revised ed.). McFarland. p. 77. ISBN 9780786486410. ^ a b Kapell, Matthew; Lawrence, John Shelton, eds. (2006). Finding the Force of the Star Wars Franchise: Fans, Merchandise, & Critics. Peter Lang. p. 259. ISBN 9780820463339. ^ Fischer, Russ (April 1, 2006). "The many deaths of Bruce Wayne's parents, ranked". Los Angeles Times. Retrieved June 12, 2017. ^ Wilonsky, Robert (December 12, 2002). "End of the Road". Miami New Times. Retrieved May 30, 2007. ^ Willman, Chris (September 16, 1994). "Movie Review : 'New Age' Couple Coping in Culture Bought and Sold". Los Angeles Times. Retrieved June 12, 2017. ^ Bowsher, Allison. "9 Actors Who Terrified Us In The Original Goosebumps". Much.com. Retrieved June 12, 2017. ^ a b Stine, R. L. (1994). Attack of the Mutant. Scholastic Incorporated. ISBN 9780590483551. ^ West, Adam; Rovin, Jeff (1994). Back to the Batcave. Berkley Books. ISBN 9780425143704. ^ Curtiss, Aaron (February 26, 1998). "It's Tough Getting to the Payoff of These Video Casino Games". Los Angeles Times. Retrieved June 12, 2017. ^ Muir, John Kenneth (2004). The Encyclopedia of Superheroes on Film and Television, 2d ed (illustrated, revised ed.). McFarland. p. 150. ISBN 9780786437559. ^ Muir, John Kenneth (2004). The Encyclopedia of Superheroes on Film and Television, 2d ed (illustrated, revised ed.). McFarland. p. 123. ISBN 9780786437559. ^ Hofius, Jason; Khoury, George; Ross, Alex (2010). Age of TV Heroes: The Live-Action Adventures of Your Favorite Comic Book Characters. TwoMorrows Publishing. p. 22. ISBN 9781605490106. ^ a b Wilkinson, Alissa (June 10, 2017). "7 times Adam West played "Adam West," and it was great". Vox.com. Retrieved June 14, 2017. ^ "Stefy – Chelsea". www.roxwel.com. Archived from the original on 2017-08-07. ^ "Adam West and Davy Jones meet Sexina". 10zenmonkeys.com. Archived from the original on December 14, 2008. Retrieved November 16, 2008. ^ "Stars T Through Z". Palm Springs Walk of Stars. Archived from the original on December 6, 2000. Retrieved June 10, 2017. ^ "Adam West receiving a star on the Hollywood Walk of Fame". March 31, 2012. Archived from the original on June 29, 2012. ^ Baguio, Lindsey (June 10, 2017). 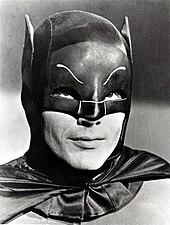 "Adam West to Receive Walk of Fame Star April 5". Patch. Retrieved June 14, 2017. ^ Melrose, Kevin (January 30, 2013). "Watch the superhero episode of PBS's Pioneers of Television". CBR.com. Retrieved June 12, 2017. ^ Sobczynski, Peter (June 11, 2017). "Adam West: 1928–2017". RogerEbert.com. Retrieved June 12, 2017. ^ Logan, Michael (October 14, 2013). "The Comics' Real Heroes". TV Guide. p. 27. ^ "'Big Bang Theory' lands 'Batman' star Adam West for 200th episode". Entertainment Weekly. February 3, 2016. ^ Wilkinson, Alissa (June 10, 2017). "7 times Adam West played "Adam West," and it was great". Vox. Retrieved June 13, 2017. ^ a b Romano, Nick (June 10, 2017). "Batman beyond: Adam West's 14 best cameos and appearances". Entertainment Weekly. Retrieved June 13, 2017. ^ a b c d Hischak, Thomas S. (2011). Disney Voice Actors: A Biographical Dictionary. McFarland. pp. 221–222. ISBN 9780786486946. ^ a b Morrow, Brendan (June 10, 2017). "Adam West as Catman on 'Fairly Odd Parents': 5 Fast Facts You Need to Know". Heavy. Retrieved June 13, 2017. ^ Rabin, Nathan (January 26, 2006). "Seth MacFarlane". The A.V. Club. Archived from the original on February 24, 2012. Retrieved September 26, 2007. ^ Jones, Stephen (2011). The Mammoth Book of Best New Horror 22. Hachette UK. p. 84. ISBN 9781849017725. ^ Guinness world records 2009: Gamer's edition. Guinness World Records Ltd. 2009. p. 176. ISBN 9781904994473. ^ Tobias, Scott (March 14, 2006). "Marc Ecko's Getting Up: Contents Under Pressure". The A.V. Club. Retrieved June 14, 2017. ^ Whitehead, Dan (December 5, 2006). "Chicken Little: Ace in Action". Eurogamer.net. Retrieved June 14, 2017. ^ Nery, Lincoln (2016). Batman A Trajetória. Clube de Autores. p. 128. ^ "Hebrew National Hot Dogs Campaign". adamwest.com. Adam West Enterprises. February 5, 2011. Archived from the original on December 1, 2017. Retrieved June 15, 2017. ^ "Adam West", Biography, A&E Television (biography.com), 2017. Retrieved June 17, 2017. ^ a b Tanos, Lorenzo (2017). "Adam West's Third Wife, Marcelle Tagand Lear: Helped Him Beat Alcoholism", Inquisitr [sic], Tampa, Florida, June 10, 2017. Retrieved June 17, 2017. ^ a b Chalmers, Robert (August 13, 2005). "Adam West: Behind the mask". The Independent. London: Independent Print Limited. Retrieved June 10, 2017. ^ Gates, Anita (June 10, 2017). "Sad Day for Gotham: Adam West, Who Played Batman, Dies at 88". The New York Times. ISSN 0362-4331. Retrieved June 13, 2017. ^ Barnes, Mike (June 10, 2017). "Adam West, Straight-Faced Star of TV's 'Batman,' Dies at 88". The Hollywood Reporter. Los Angeles: Eldridge Industries. Retrieved June 10, 2017. ^ "Van Williams, Television's Green Hornet, Succumbs to a Real Crime-Fighting Bug". Tim Allis and Darlene Donloe. people.com. ^ Lowry, Brian (June 10, 2017). "Adam West, TV's 'Batman,' Dies at 88". Variety. Los Angeles. Retrieved June 10, 2017. ^ "TV Batman actor Adam West dies at 88". London: BBC News. June 10, 2017. Retrieved June 10, 2017. ^ "Adam West: Star of '60s 'Batman' dies". CNN.com. June 11, 2017. Retrieved June 30, 2017. ^ Conroy, Kevin. "Adam West was an incredibly good, generous actor. Loved working with him as Gray Ghost. A true gentleman". ^ "Los Angeles Pays Tribute to Adam West With Bat-Signal". Retrieved June 30, 2017. ^ "Bat signal lights up Walla Walla sky in honor of hometown hero". Retrieved June 30, 2017. ^ "How Family Guy Will Handle Mayor West After Adam West's Death". June 30, 2017. ^ "Powerless: DC Honors Adam West By Releasing Unaired Episode". June 17, 2017. ^ "Comic Con draws thousands of fans to Hanover Mall". Patriot Ledger. Retrieved 29 October 2017. ^ "Southcoast Comic Con returns to Hanover Mall". Wicked Local Hanover. Retrieved 29 October 2017. ^ Britton Peele. "Fan Expo Dallas will play host to a 'Rocky Horror' cast reunion". Guidelive.com. Retrieved 9 December 2017. The other guests so far include comic book legend Stan Lee (in what they say will be his final Texas appearance), renowned comic artist Jim Lee, Norman Reedus and Jeffrey Dean Morgan (The Walking Dead), Ian Somerhalder and Paul Wesley (The Vampire Diaries), Adam West and Burt Ward (Batman) John Barrowman (Arrow, Doctor Who) and Robin Lord Taylor (Gotham). ^ Linda Zavoral. "Adam West's final Batman appearance in the Bay Area". Mercurynews.com. Retrieved 9 December 2017. West, Adam; Rovin, Jeff (1994). Back to the Batcave (Trade Paperback ed.). New York City: Berkley Books. ISBN 978-0425143704. Khanna, Vikrant (2017). The Girl Who Knew Too Much: What if the Loved One You Lost Were to Come Back?. New York City: Penguin Random House India Pvt Ltd. ISBN 978-0143439943. ASIN 0143439944 .